Best of Omaha 6 Years running! – 168th from Dodge to Maple NOW OPEN! At the Paw Spa Pet Resort, we love your pet as much as you do. We are the best pet boarding facility in Omaha. We offer overnight, daycare, grooming, and even on-site vet services. Our animal-loving and top-notch staff will take the best car of your pet with 24 hour monitoring and daytime petcams so you can see your dog in action. We were selected Best in Omaha for six years in row. You can check us out on KETV Channel 7 right here! Our pet boarding facility has a state-of-the-art air handling and fresh air exchange operating system. This insures the highest quality of air and eliminating virtually all airborne pathogens. All day care packages include unlimited, fully supervised play area use and pool privileges. We ensure to exquisitely attend to all your pet needs. Whatever the grooming needs for your pet, we have it covered. We also offer the convenience of on-site affordable vaccinations. The Dobesh Vet Clinic will be available on the first Friday of every month from 9-11am. Check out our 5 state-of-the-art Petcams! Ever wonder what your pet does when you’re away? When you’re on the go and your furry friend is snuggled up at his home away from home, playing with his pals, or swimming the say away, you can take comfort in knowing they are full cared for and loving life. You can see them here, live, at play time. Blondo cameras are now up, as well! Gift cards are a wonderful gift for pet owners. 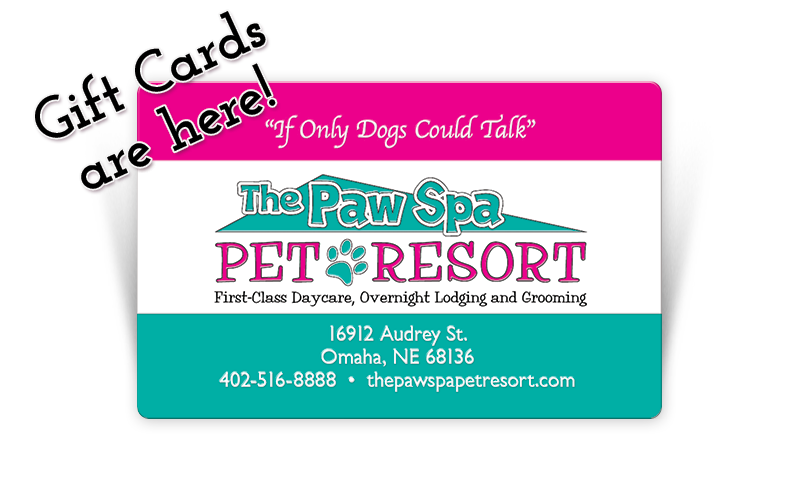 Our cards are the perfect solution for the pet lover who has everything and are redeemable for grooming, daycare or overnight boarding. They are ideal for holidays but are an “anytime” present as well and can use them whenever they choose as there is no expiration date.